With its yellow walls and Vietnamese flag, Com Ngon is a relaxed and casual Vietnamese restaurant. The interior is decorated with Vietnamese objects and paintings. At lunchtime, it is especially popular among women and has a calm atmosphere. The restaurant focuses mainly on classic Vietnamese dishes, with plenty of types of noodle dishes, starting with pho, to choose from. The food has a unique flavor thanks to the extensive use of herbs. Recommended for those times when you feel like something other than Japanese food! *This article introduces the lunchtime menu, available from 11:30 a.m. to 3 p.m.
Pho is the most popular of Vietnam's noodle dishes. With its characteristic rice noodles and chicken soup, the dish has a delicious aftertaste thanks to its flavoring with cinnamon and other spices. Also includes Pickle Green and Braised Pork served with Rice. Comes with two spicy and juicy fried chicken pieces. The chicken's juices also soak in deliciously to the long and thin high-grade Thai jasmine rice. When you feel like a change of flavor, try it with the bittersweet Soy sauce dressing! The herbs and tender shrimp in these spring rolls' rice paper wrappers are really packed with flavor. The herbs' coolness and fragrance of this dish really fill the mouth; try it with either the sweet miso sauce or the light Vietnamese Soy sauce dips. After pouring hot water into the filter at your seat, it'll take around 7 to 8 minutes for the coffee to fill your cup. It's bitter, but you'll find as you drink it that it also has a mysterious sweetness. The set menu is the best choice for lunch. 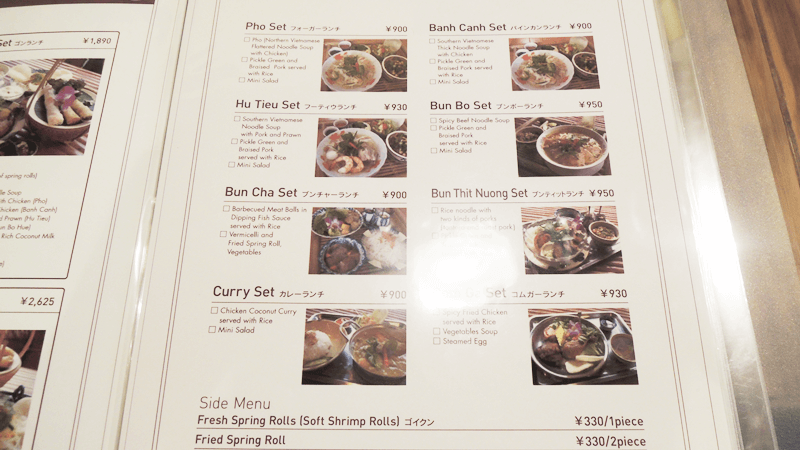 There are 6 types of noodle set, and 3 types of rice set. *There are only 2 types of rice set on the English menu. Take your time and mull over each set's type of noodle, flavors, and ingredients to choose the set that's right for you! Those who aren't too fond of herbs can ask to have their dish served without herbs. Especially recommended for lovers of herbs. You can get a larger portion of noodles and rice for just 100 yen more! Com Ngon is located in a business district of Kyoto. The pho noodles and other Vietnamese dishes are really delicious, and I often go to this restaurant! Their pho is of course delicious, but I like the braised pork rice you get with their set meals so I hope you will try it at least once! As the restaurant can fill up as soon as it's opened, please plan ahead.